A friend coming over for lunch requested Cherry Dumplings (vareniki) so I had to oblige. Of course, I couldn't just leave it at that. I wanted to make some Pelmeni (meat dumplings) as well, so I ended up with both. Mix and beat until the mass sticks together. Drop teaspoon size portions into dough (circles or squares). Close off the dumplings by pinching sides together with a little water. Play with the shape of the final dumpling based on the initial shape of your dough. Squares become envelopes, circles become semi-circles with "ears" pinched together...or invent a shape of your own. 1 head of cauliflower, separated into "trees"
Combine the ingredients in the pickling liquid. In a glass container, layer the vegetables and pour the pickling liquid over them. They should be just covered. Close, refrigerate for about a week, and then enjoy! A little trip to Whole Foods and Trader Joe's and I ran out of refrigerator space. As any creative cook, I cleaned out by creating a dish that rid me of extra bottles / jars in exchange for the much needed space. In this case, a can of Calimyrna figs, remains of maple syrup, half a bottle of strawberry lambic opened the night prior and freshly purchased, gorgeous slice of veal osso bucco. I pan roasted the tied, seasoned (with salt and pepper) veal to brown on all sides. Rested it on a bed of sliced onions in a baking pan. Drizzled with pan drippings, strawberry lambic (1/2 bottle), and maple syrup (about 4 tbsp). Threw in the tiny dry figs and covered with tin foil. After roasting covered at 375F for 1.5 hrs, I uncovered, drained the sauce, added seasoned potato wedges and sprayed them with olive oil. Another 25 minutes and we inhaled the very late dinner. What could be better then a perfectly tart and sweet combination in an orange, complimented by a pink toned flesh?! If you haven't tried a Cara Cara orange, change that immediately. I first tried these last year, and am thrilled they are in season again. These are a "mutation" of the navel orange grown in Argentina. Little needs to be added to describe the pictures in this post. Jean Philippe Patisserie at the Bellagio was our stop (several times) for a quick snack and coffee. Though it can be challenging to find a seat, especially from late morning to early afternoon, it's worth the challenge. 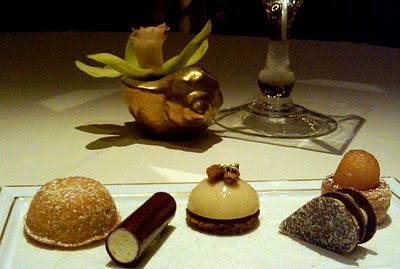 We ordered the Tasting Menu paired with wines, which was a great decision, as we tasted wines which we may not have chosen for ourselves and thoroughly enjoyed them. Our waiter was very knowledgeable, which I love. However, I did find him very formal and a bit impersonal. 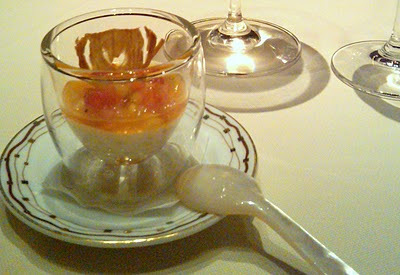 The dishes that stood out for us: butter poached lobster and foie. 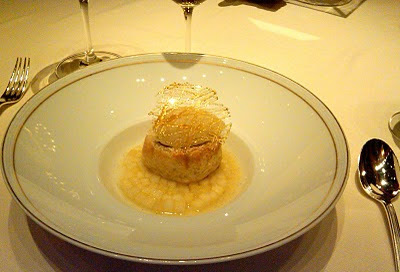 Both dishes were perfectly cooked and married the ingredients and flavors in creative and unexpected ways. 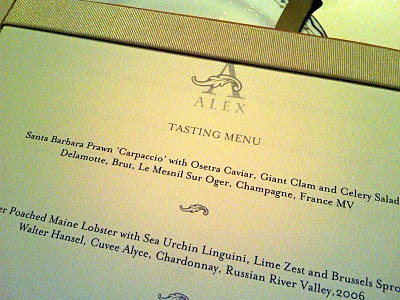 The lobster was served with sea urchin linguine, baby Brussels sprouts and uni. 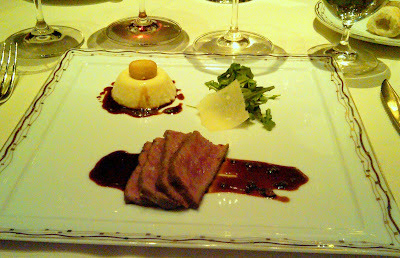 The foie...it was a cloud of goodness, with baby turnips made two different ways, steamed and marinated. Oh, so very, very perfect. The other dishes I found good, but not amazing. The turbot was perhaps a bit overcooked for my taste and I didn't get the relationship between its flavors and the caper salad. The waguy beef was okay. Actually surprisingly chewy on my plate, but my husband had a different experience. The parsnip pannacotta on the same plate was amazing, as was the deep fried bone marrow on top. I would have enjoyed a bit more seasoning on the marrow, as it would have been a good contrast from the parsnip. 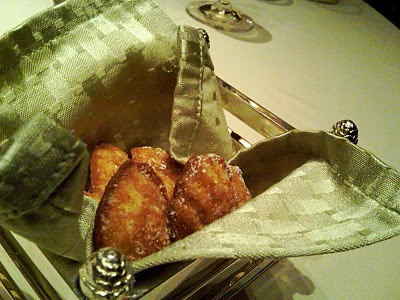 Warm Madeleines at the end of the meal with the other petite fours were delicious. 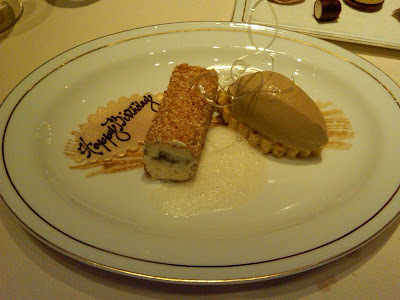 I especially enjoyed the berry tulle filled cigar. We were sent home happy nonetheless with a box of tiny french lemon-flavored maroons.